Anyone can receive an award if they reach the required standard of merit or service, and honours lists include a variety of people from diverse backgrounds. Do you know someone who deserves to be recognised for work they do in the community? Any member of the public may nominate someone for a National Honour - be it a colleague, volunteer, teacher etc. There are many people across our County who work tirelessly in the community and who deserve to be recognised. The Lord-Lieutenant would like to encourage members of the public to put forward suitable nominations. It is important to recognise that a nomination can take around 18 months or longer to go through the vetting process, from the point it is submitted to the Cabinet Office. The fact of nomination should be kept strictly confidential as sadly a relatively few people can be honoured and it is best to avoid disappointment. 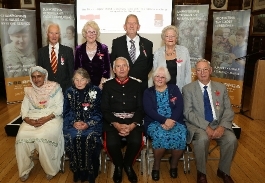 If a nomination proves unsuccessful, it is sometimes possible for the Lord-Lieutenant to arrange some other form of recognition, as a ‘thank you’ for exceptional service. Recipients of all Honours except the BEM are invited to Buckingham Palace or Windsor Castle to receive their award. The Lord-Lieutenant presents the BEM honours on behalf of The Queen.